Today is Winnie the Pooh Day. Yes, there's a holiday for everything! 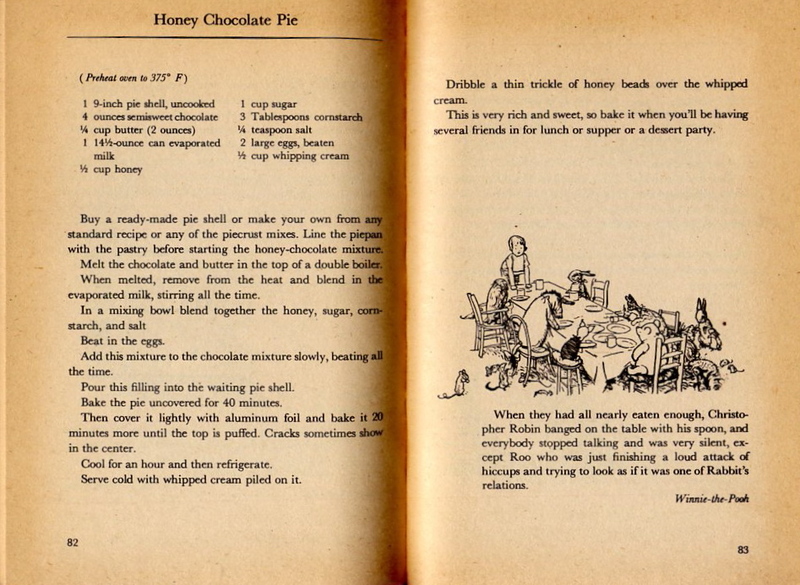 Here's a recipe for Honey Chocolate Pie from The Pooh Cook Book by Virginia H. Ellison, illustrated by Ernest H. Shepard (1969: Dell Publishing). 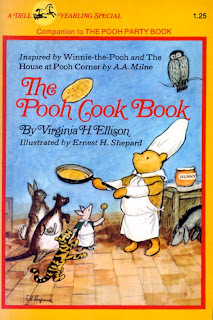 This Cook Book (yes, two words) is inspired by Winnie-the-Pooh and The House at Pooh Corner by A.A. Milne. One of my favorite stuffed animals as a child was Tigger, and I have always been a big honey fan, probably because of the Winnie the Pooh stories. I have honey every day, and perhaps Winnie had allergies, too, and needed his "Hunny. "I have found that a teaspoon of local honey every day has alleviated my Spring allergies. As a cook you should know that honey is almost twice as sweet as sugar, and yet when you eat it, it doesn't make you want to go on eating sweets. Honey is also healthful, and very good for active people. When used in cooking it keeps food moist and adds a flavor all its won, as you will see when you've made some of the dishes in The Pooh Cook Book. Clover honey is the best all-purpose honey but there are as many flavors, or kinds of honey as there are blossoms on flowers and bushes and trees."